AMD has announced their flagship Datacenter solution, the Radeon Pro V340. The new flagship is a dual-chip juggernaut, featuring AMD’s high-end Vega 56 GPUs on a single board solution which has been designed to handle and accelerate visualization workloads for a board range of users such as engineers, content creators, designers and architects. 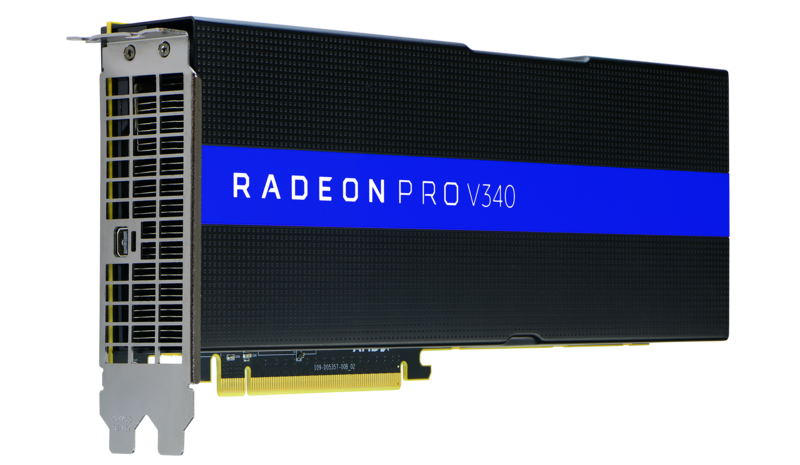 The AMD Radeon Pro V340 graphics card is built as a data-centric solution and is based on the new Vega GPU architecture. 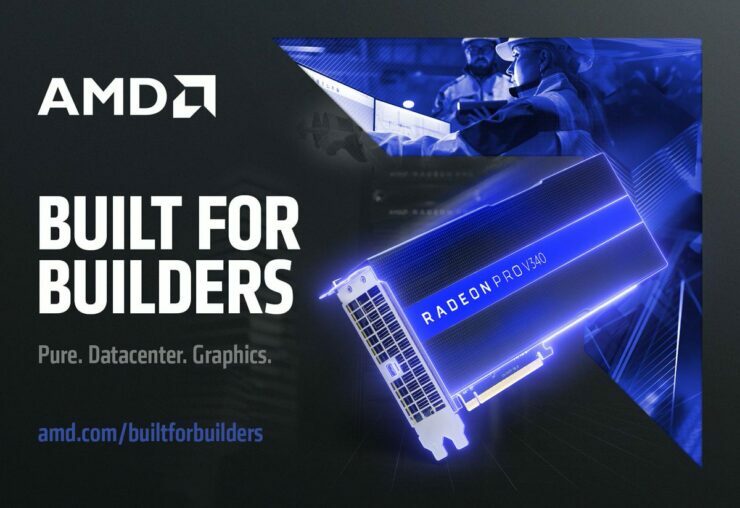 There is a range of Vega based Radeon Pro graphics cards which includes the Radeon Pro Vega 56, Radeon Pro Vega 64, Radeon Pro SSG and the Radeon Frontier Edition. 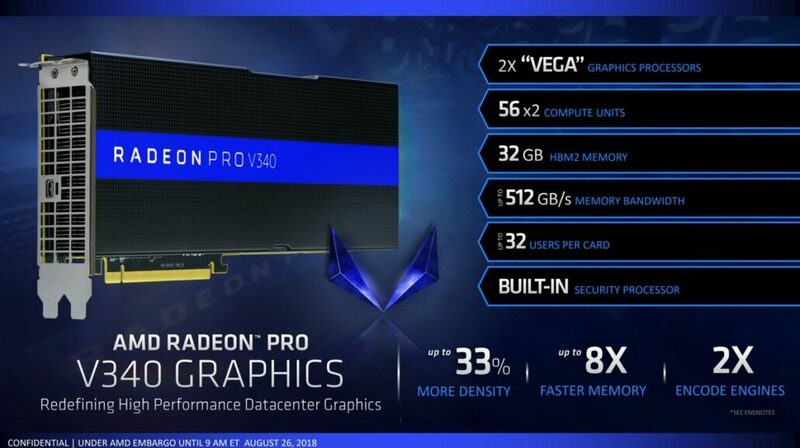 It looks like the Radeon Pro V340 is the flagship based on its raw specifications. The card is equipped with dual Vega 56 GPUs, that’s 7168 stream processors packed in 112 CUs (3584 stream processors / 56 CUs per GPU), based on the 14nm FinFET GPU architecture. These cards will also come with 32 GB of HBM2 VRAM (16 GB per GPU), delivering up to 512 GB/s of raw bandwidth across a 4096-bit memory interface (per GPU). The card comes in a passive cooled, dual slot design which is ideal for data centres and is said to feature a TDP of 300W. The card features dual 8-pin power connectors to boot. The heatsink is also a thing to talk about as it packs dual vapour chamber blocks with aluminium fins for heat dissipation. The support bracket comes with a thick heat pipe that is outlined along the whole power delivery system. There’s also a nice backplate that goes on the black. The shroud uses the Radeon Pro blue and black colours which we are looking at for some time now. An ideal use case of this GPU would be to pair it up with a 32 Core AMD EPYC CPU or if you are a content creator, you can always use that AMD Ryzen Threadripper WX series (2990 and 2970WX) and couple them up with the Pro V340 for massive amounts of CPU cores and GPU compute units, running in tandem, for unprecedented amounts of Compute and virtualization features. Superior User Density: Supports up to 32 1GB virtual machines, up to 33 per cent more than the competitive solution. Ultra-Fast Frame Buffer: HBM2 memory with Error Correcting Code (ECC) and better power efficiency than competing solutions allow fast paging apps to run incredibly fast. The V340 hardware combined with the new software stack comprises AMD’s MxGPU technology. MxGPU stands for multi-user GPU and it does just that. It lets multiple users share a very high-performance GPU giving them highly secure, deterministic workstation-class performance, delivered from the cloud. With 2 GPUs pounding on 32 GB of HBM2 framebuffer, it supports up to 32 users per card, enabling density and scalability. AMD has announced the card at VMworld today and is expected to start shipping at the end of this year (Q4 2018) through AMD’s partner system providers. There’s no word on the pricing yet but we will update once we know.